Cameron Operation: For this weekend, Cameron Main and Cameron Connector gates will be open to the Public for access to Pass Main (Mount Arrowsmith).The entire Cameron Operating area will NOT be open for hunting as there will be work crews in this area. For your safety there will be Security personnel along Cameron Main; they have been stationed there to assist you with safe passage during active hours. Northwest Bay Operation: For this weekend, access beyond the firewood area at 155-114 on the 155 Mainline will be closed to the Public. Buckley Bay Operation: For this weekend, access to the Tumblewater Mainline will be closed to the Public. Chemainus (Copper Canyon) Operation: For this weekend, access beyond the 22 km mark on the Chemainus Mainline will be closed to the Public. Comox Main at 2.4km will be closed for bridge work starting Monday Oct 2nd at 7am until Wednesday Oct 4th. Traffic from the woods side of the closure will be required to use Ash main. Signs will be posted on either side indicating the closure. Late update: Buckley Bay gate was damaged Friday night. Hastings gate will be opened as an alternate route please use the sign in sheet at the gate. 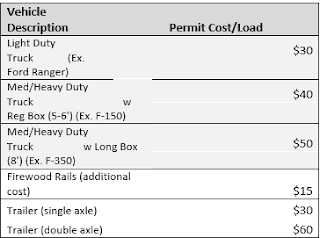 Cochrane Road: Permits for this area can only be purchased onsite at the gate located on Lower Cochrane Road. Proceeds from this week's fundraiser will benefit the Deep Bay Volunteer Fire Department. Nanaimo Lakes Road 45: Permits for this site can only be purchased from the volunteers stationed at the NLR 45 gate. Proceeds from this week's fundraiser will benefit the 1st Nanaimo Scouts. 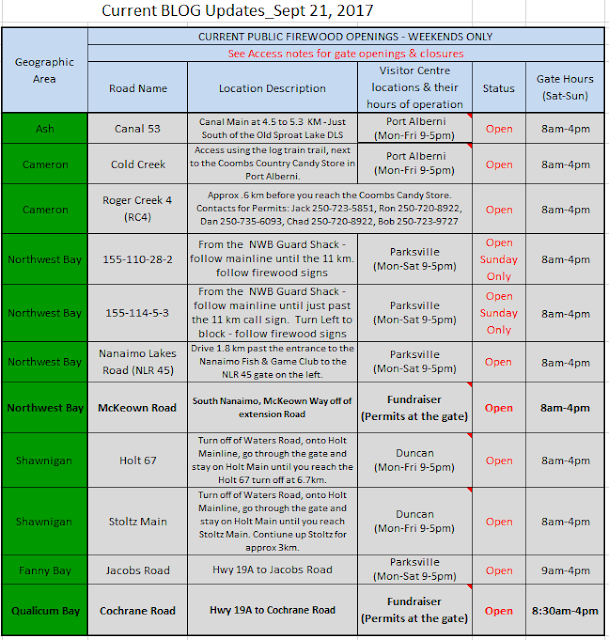 Cameron Operation: For this weekend, Cameron Main and Cameron Connector gates will be open to the Public for access to Pass Main (Mount Arrowsmith) and Labour Day Lake. The entire Cameron Operating area will NOT be open for hunting as there will be work crews in this area. For your safety there will be Security personnel along Cameron Main; they have been stationed there to assist you with safe passage during active hours. Northwest Bay Operation: For this Saturday, access beyond the 8 km mark on the 155 Mainline will be closed to the Public. Buckley Bay Operation: For this Saturday, access to the Tsable River Mainline will be closed to the Public. Cochrane Road: Permits for this area can only be purchased onsite at the gate located on Lower Cochrane Road. Proceeds from this fundraiser will benefit the Bowser Seniors Housing Society. 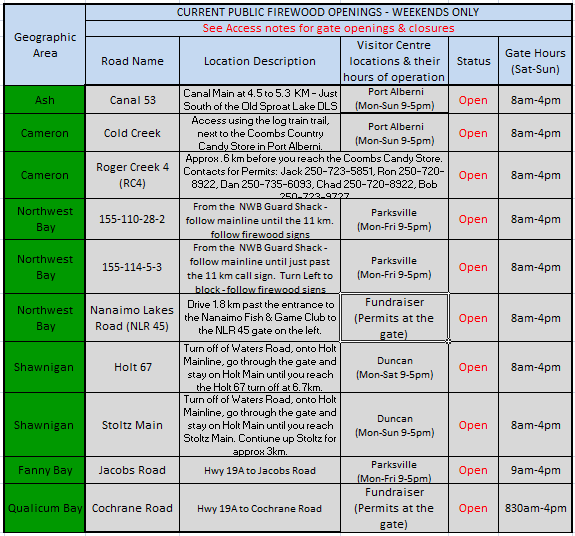 Nanaimo Lakes Road 45: Permits for this weekend can only be purchased at the 3 Visitor's Center listed below: Next weekend, permits for this area will be available through fundraiser volunteers stationed at the NLR 45 gate.